This blog looks for helping in the process of the initial data load to One Exposure, core data structure that feeds Cash Management applications. This is information is applicable when you are using Classic Cash Management and you will install S/4HANA and with it, the solution Cash Management Powered by HANA. The objective is to provide some guidance on how to perform this steps and share some insights. The knowledge here was obtained based on personal experience and collaboration of other colleagues experienced in the subject, mainly my colleague Hernan J. Hevia https://people.sap.com/001169647 . We will review some key concepts and recommendations for the process. DISCLAIMER: The recommendations on this blog are based on personal experience, research and analysis of what we determined it was correct for this specific project. It may be applicable to others, but it is not a step by step process officially provided by SAP, so you may want to re-validate. One Exposure is a central hub where most of information for Cash Management transactions are stored. It receives Data from FI (accounting), Treasury and Risk Management, Purchasing from MM and Sales from SD, becoming a real single source of truth for operations affecting current Cash Position. Cash Forecast and financial risks for operations. One Exposure information is stored in table FQM_FLOW. FIORI applications and new Cash Position FF7AN consume data for One Exposure, replacing obsolete table FDSB. However, In the previous paragraph I said that “most” of critical information for Cash reports is stored in One Exposure, so it is worthy to highlight that memo records are still stored in table FDSR. At high level, the process consists of running some programs to enrich the data before the main load, that is done with the execution of Flow Builder program (planning level, insert flows, insert housebanks). This program will fill table FQM_FLOW (One Exposure). First, it was hard to understand the logic of flow builder. What documents will select, why, under which criteria, etc. It was hard to understand the results, as the amounts were not matching the balances before conversion. We faced performance problems, due to the quantity of registers and how the program was analyzing the document clearing chain. The program has very few filters, as it is supposed to run for everything, so it was hard to have control of what we are uploading. Archived documents were not loaded, so the balances were incorrect. In order to have a correct ending balance for a cash account, you need to load from the first document to the last. However, as the documents from 3 years and before were archived, those were not loaded, causing an incorrect balance. Uploaded initial balances for Cash Balances to certain date to the end of a determined fiscal year. Run Flow Builder program for the years after those initial balances. In this way, the Initial Balances + Line items showed the correct amount for the Cash account. This allowed us to have a better control of what information we were loading and what the expected result should be. We did not put too much focus on the forecast and documents from MM, SD and other components. However, loading the line items for the last couple of years would provide enough information to allow to do the forecast. Points above are not part of this blog. There is enough information in the web about how to do these configurations and if you are converting a system using Classic Cash Management is pretty straightforward. Using transaction FQM_INIT_BALANCES you can upload initial balances for Cash Accounts. This should reflect the balance of the bank account at the date of the upload. This balance, normally should match the balance of the GL account for the bank account. Program documentation will mention the format required, but it is simply an excel with general format. This is transportable. You use this activity to activate or deactivate source applications for One Exposure from Operations on a company code basis. Once a source application is activated, the forecasted transactions from this source application are integrated into the One Exposure from Operations hub, and the forecasted cash flows are therefore available in Cash Management reporting. We did not find the need of execution this program at the moment. As we are using Classic Cash Management our accounting info has the planninng level and Vendor/Master records the planning group info. If you want to use historical cash management data in the Cash Management applications, you need to execute this program first to insert house bank (field HBKID) and house bank account (field HKTID) data into table BSEG before you use the applications. The program basically will fill House Bank and Account ID fields in BSEG. It is to derive liquidity items for line items that are already posted. You must run this Customizing activity to generate liquidity items data for line items that are already posted but are missing liquidity items. The liquidity items will be stored in BSEG and then will be transferred to One Exposure. In order to this step derive Liq. Items correctly, you need to have the liquidity planner configuration already perform. You derive flow types for accounting document line items that have already been posted. If a document in BSEG has no flow type, it will not be loaded into One Exposure. You use this Customizing activity to load transaction data from source applications into One Exposure from Operations, from all sources. 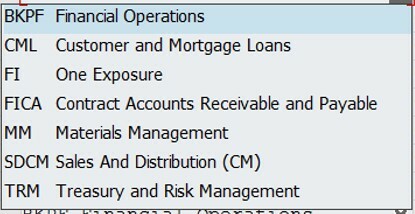 For FI and MM, you should use the program in next step “Build Cashflow from Operations”, the flow builder. This is the Flow Builder program. It builds flows from FI and MM. Program is FCLM_FLOW_BUILDER. This program is critical, as it us also used for the daily data load from accounting, but this blog focus in it’s usage for initial data load. Running Type: “Mass” for initial load. It indicates the number of layers of documents to load in a document chain. So if you select “1”, it means that when Flow Builder gets a document, it will look for 1 document in the clearing chain. If you select “0” it will load to one Exposure Only the main document captured. It will load the other documents in the chain into flow builder. When checking the documents in the FIORI app, it allows you to drill down to those documents “connected” by the tracing chain. It can inherit some data, for example if one of the documents in the chain does not have populated the HB and Acc ID in BSEG, when they get loaded and connected through the tracing chain, that data will get completed. Company code: If you have company codes with really large set of records, it is recommended to split them and not do 1 execution for everything. Merge Tax items: By checking this box, it will merge the tax line items with the line item that originates the tax. After running this steps, you should be able to see your information in One Exposure, by then in your Cash Management applications. I hope you found this useful and I insist that suggestions, corrections or any information that could help to increase the knowledge of the community on this process, is more than welcome.